Making salads can be as simple or as complicated as you want them to be. These healthy salad recipes below are ever so easy for you to make up and you will be proud to serve them up to your friends and family. Too many different sauces, different dressings and complicated ingredients can create hard work and take all the pleasure out of the experience of making your salad. 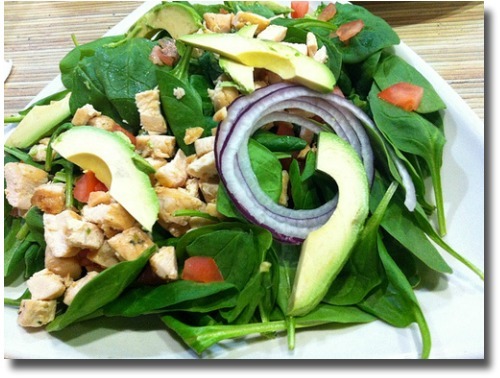 Here you will find an easy salad recipe or two that will become favorites with your family. Add or subtract ingredients to your liking. Just enjoy the whole experience of experimentation with food textures and tastes. The Chicken in these easy salad recipes can either be pre-roasted, grilled or poached. When it comes to seasoning, remember to always take into consideration the others who are going to eat the meal. It is important to be careful with the salt, pepper, chili etc. Try not to overcook the white meat as this will make it too tough. 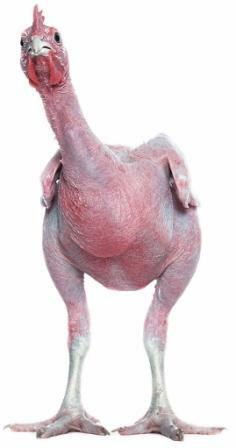 If you are poaching the chicken meat the same rule applies. Cutting the chicken into smaller pieces reduces the cooking time and helps with keeping the meat tender. Poaching sometimes can mean, bringing the liquid to the boil, simmering for a few minutes, covering, removing from the heat and allowing the chicken to just stew in the liquid until cool. Remove the meat, drain the liquid and shred into pieces ready to add to the salad, the meat is tender, white and yummy. 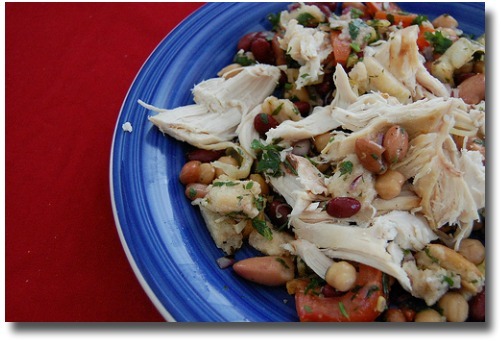 In large bowl, gently stir together black beans, chicken, onions, red and yellow peppers and tomatoes. In small bowl, mix together jalapeno pepper, lime rind and juice, garlic, salt and pepper; gradually blend in the oil. At the Picnic pour over salad; add coriander and toss gently. The picture below is a simple variation on the recipe above and can taste just as delicious. Prepare the lettuces, put into a container and keep chilled till at picnic. Combine all these ingredients and store in an airtight container, keep chilled till at the picnic then shake well and serve over the salad mix. 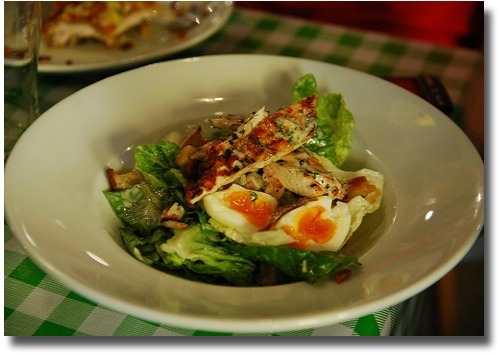 At the picnic - take the chilled and fresh lettuces and greens, tomatoes, chicken, bacon, avocado and eggs, combine gently . Sprinkle with cheese, you can leave this out if you want to. Combine all ingredients in jar, cover tightly and shake vigorously. Add to salad mix or allow the guests to add their own. 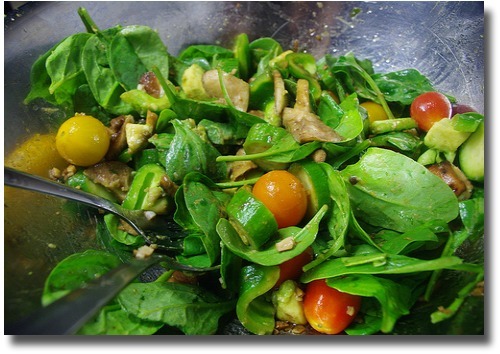 At The Picnic - Combine all the salad ingredients and stir well. Add the dressing and enjoy. 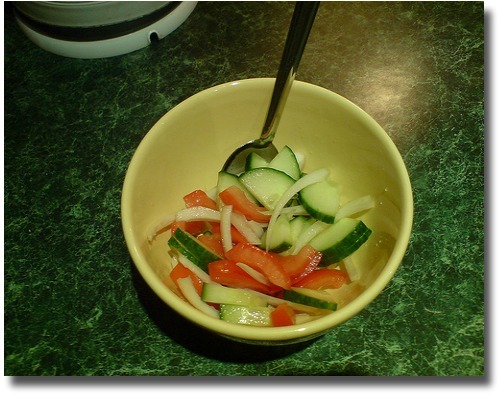 When making up easy salad recipes with vegetables it is usually about the dressing and/or the colour. Easy salad recipes that are made with all green vegetables and a hint of yellow you can use for a cool feeling. Reds, Yellows, Purples and Greens can be used for that festive occasion. Cover potatoes in pan with cold water and bring to boil over high heat. 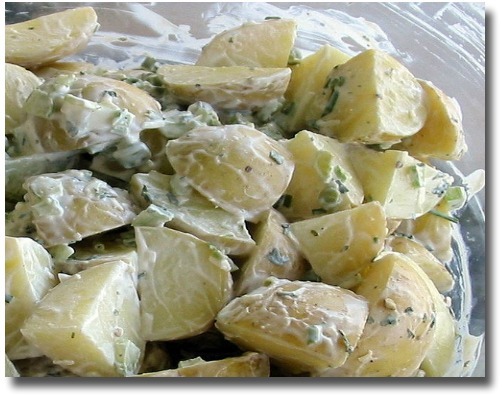 Cook until potatoes are tender. Meanwhile, thinly slice mushrooms, onions and celery and combine in mixing bowl. When potatoes are tender, drain and halve or quarter, depending on size and add to bowl. When cool, chop eggs and add to bowl. Add mustard and mayonnaise, and season to taste with salt and pepper, mixing everything together gently. Warm bread cubes in 275 degree F oven, tossing until hard and dry but not burnt. Store these until ready to use. Mash garlic into side of large salad bowl. Ease egg into boiling water and boil exactly 1 minute, then crack into bowl, breaking it up with fork. Add salt, lemon juice, olive oil and Worcestershire. Store this in air-tight jar until ready to use. 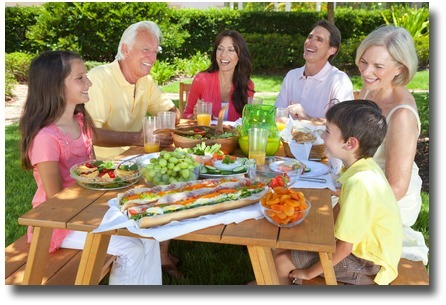 At The Picnic - add lettuce leaves and cubed bread (croutons), tossing to coat thoroughly. Mix together at the picnic and serve. You can add other vegetables to this easy salad recipe as you choose eg, sliced raw zucchini, beans, tomatoes etc. Have all ingredients ready to mix together at the Picnic.....Wash and stem tomatoes. Dry completely. Mix mayonnaise, vinegar, olive oil, salt, and basil, store in air-tight container until ready to use. At the picnic - Pour over tomatoes, crumble bacon over all and stir to coat tomatoes with dressing.